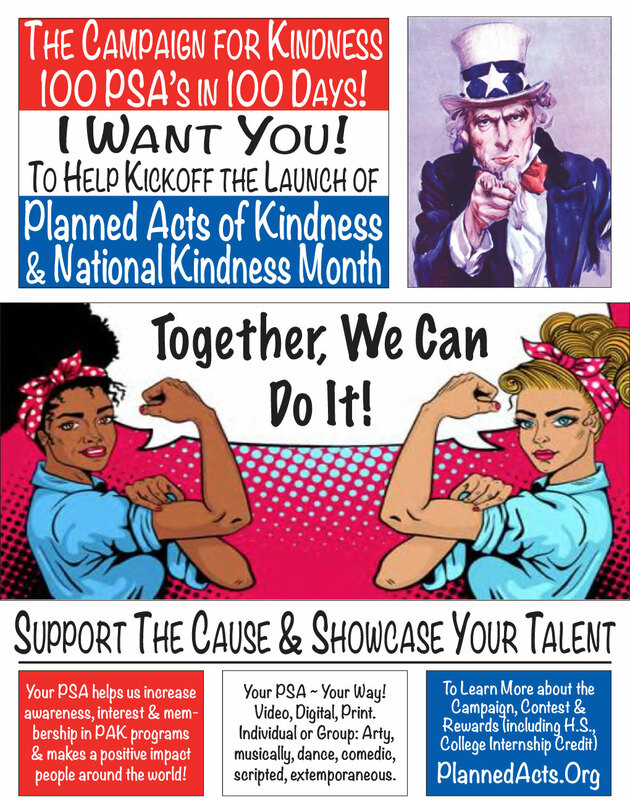 To coincide with the launch of Planned Acts of Kindness, The Karma Club and National Kindness Month in June, we invite people from all over to create Public Service Announcements in support of our outreach programs. The first objective of the PSA campaign is to increase awareness, generate interest, and grow membership in Planned Acts of Kindness Programs. The second objective is to give people of all ages and experience the opportunity to create their own PSA using whatever medium they wish — Video, Digital, Print — using whatever creative medium they choose — Scripted, extemporaneous, arty, musically, dance, stand-up comedic, sit-down comedic — individually or in a group. The Rewards: Gifts, Gifts and More Gifts! There are very few times in our lives when we have the opportunity to really make a positive impact on a large number of people. If you ever wanted to be an “influencer” or someone that makes a difference in a big way … this is for you! Being an Internet Celebrity … You might not earn the big bucks, have groupies hanging off every word, or even have your own tour bus, but a stroll down the red carpet? Now, that a possibility! The top three vote-getters in each category will receive gifts from Planned Acts Of Kindness sponsors with the winners duly earning their Karmic Rewards! Incoming PSAs are categorized by type, and people vote their preferences. In the month of June, during National Kindness Month, we will take the top five vote-getters in each category and promote them through our Social Responsibility Clubs across the country and internationally. The campaign/contest will run until June 30th, when we will have several large events around the country to interview the finalists, announce the winners, and kick-off the campaign for World Kindness Month in December! PSA ideas are limited only by your imagination! (*) I have read and understand the above restrictions.